Faith wrote a lovely post on our tour to Eugene in October, including our late-night nutria sighting. 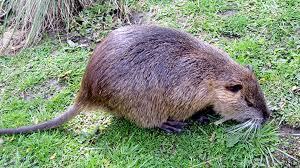 Now we get word from the New York Times, that nutria may be the new "guilt-free fur". This gets me thinking that perhaps Hand2Mouth's next fundraising event shouldn't be a cake sale/bake sale, but a nutria hunt-down and stitch-up. Perhaps our Uncanny Valley costumes could be less space-age and more Davey Crocket? Maybe we can realize our true DIY nature with a little help from, er, nature.